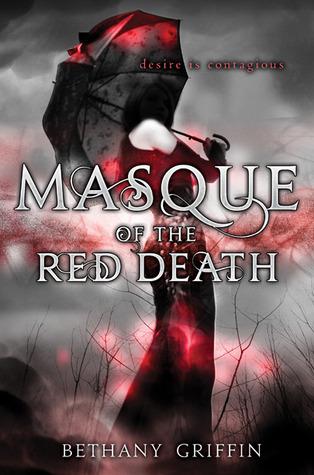 I heard such great things about Masque of Red Death, and I was really excited to read the book. The premise of the story is fascinating -- it's what I think of as a "steampunk dystopian," and the world is suffering from a contagion called the Weeping Sickness. (I love stories about survivors of plagues, which is another reason why this book was something I wanted to read!) The cover is also totally gorgeous. The author did a great job with the world building of this story. It felt very realistic, and she described it vividly. I could picture everything perfectly in my head while I was reading. The writing was great, and the pacing was done well. Unfortunately I didn't connect with the main character, Araby, as much as I wanted to. I had a disconnect with understanding her motivations behind the things she did and got involved with, and it lessened my enjoyment of this story. She was also very depressed and even mentioned thoughts of suicide. I prefer stories about protagonists who have a strong will to survive in tough situations. I think I would have enjoyed this story better if it had been told from April's perspective opposed to Araby's. I loved all the scenes with April in them, and wanted to see more of her in the story. The parts of this story that stood out to me were when Araby was with Will. I felt more of an emotional connection during those scenes, especially the ones where Will's siblings were involved. It was in those scenes that I felt more of connection with the characters, and I wish there was more of that in the book. Elliott as a love interest did not appeal to me -- he did some crazy things in the middle of the book, and I hope Araby ends up with Will, even though I wasn't happy with Will's actions in the end. (I can understand why he did what he did though). I wanted to like this book more than I did, but I'm in a minority because most people are loving it. I definitely recommend checking out a sample to see if this book is for you! Ahhh, this book just sounds amazing :D Thanks for the review!